Ayalkibet, a portly man in a garish white suit, is taking an oath. Hand raised, expression sombre, he reads a pledge to administer his café wisely. Four colleagues nod in approval. “But only for a month,” prompts one, following the text as he recites it. Ayalkibet skips over that proviso; his colleagues look up in alarm. So begins a recent episode of “Min Litazez?” (“How can I help you?”), a hit Ethiopian sitcom, in which the temporary manager schemes to extend his time in office. Who might this represent? Not, surely, Ethiopia’s new prime minister, Abiy Ahmed, who has convulsed the country’s politics by promising free elections next year and to step down if he loses. And, indeed, “Min Litazez?” is too clever for such clunky comparisons. 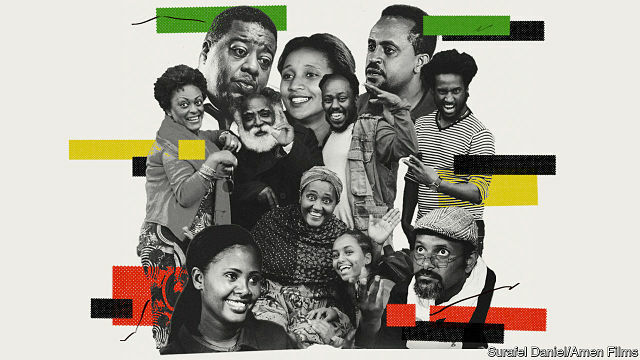 But the audience is invited to draw their own, and many viewers have seen a reflection of Abiy in the protagonist. In previous seasons there was no doubt that Ayalkibet—then a petty tyrant of the workplace—stood in for the ruling party’s authoritarian old guard, whom Abiy shoved aside last March. Now, as Ethiopians acclimatise to a more gentle leadership, the character has been transformed. No longer a dictator, he is a well-meaning but pompous honcho with a weakness for the limelight.